Vardanega’s work can be best described as an exploration of a cosmic imaginary universe. Where aesthetics meets and plays with real time and space. Where mechanics creates a poetic language about the unknown mysteries of our world. Each work investigates the physical nature of an object, a manifestation of the external universe. Light, movement, and space create art in real time. idea of real, living energy, which is constantly in action, before our eyes, the very instant in which we see the work; the idea of indetermination, linked to the chance nature of the flow of light; the idea of invisibility, with the ‘sculpture’ no longer being a palpable organization of static substances, but an interplay of immaterial waves”. (J. Clay “From the Unchangeable to Process Art”). Vardanega, therefore, begins the deconstruction of the three-dimensional concept of reality in art. 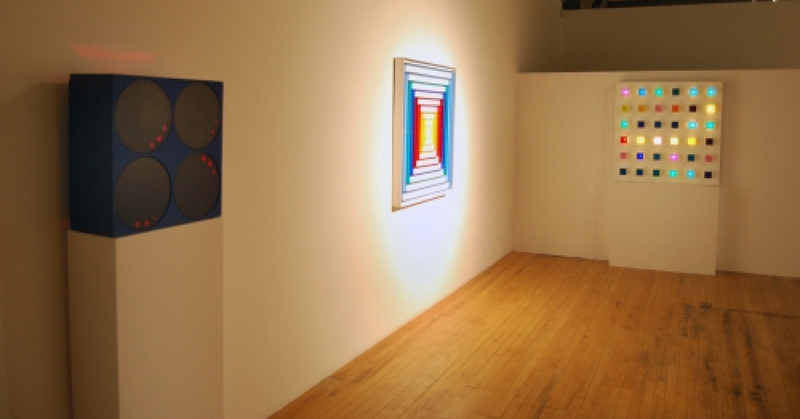 By the mid 1960’s Vardanega and his wife, Martha Boto, were living in Paris and actively engaging with other notable Latin American expatriate artists, such as Jesus Soto and Carlos Cruz-Diez; both known for their kinetic art. Vardanega and Boto, saw themselves as technicians developing and creating works for “real science fiction scenes”. Vardanega’s growing interest in programming, cybernetics, and astronomy are clearly evident in his body of work. In 1967, Serge Gainsbourg stages a short film, starring Brigitte Bardot, titled “Contact”; which includes works from both artists. The film is a futuristic technological fantasy, very evocative of its time; a clear representation of the general publics interest in the cosmos, artificial intelligence, and worlds beyond ours.